Why You Should Routinely Read Fiction | Valet. The real life benefits of cracking a book each month. 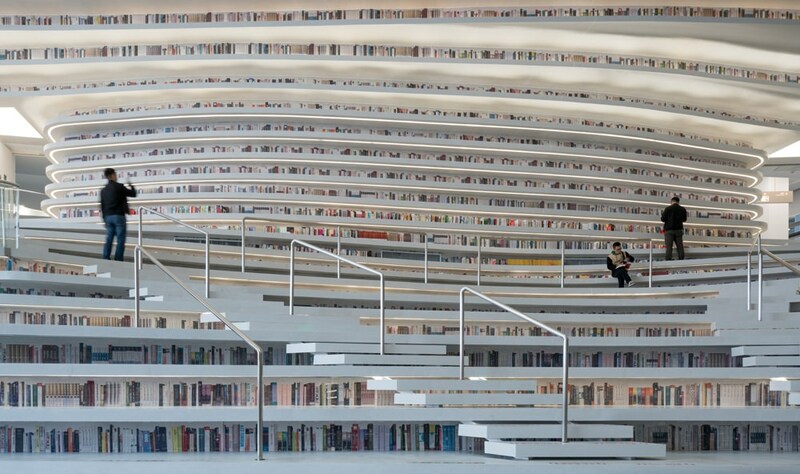 The surreal Binhai library in Tianjin, China. Your mind is a tool, and like any tool that gets used regularly, it needs to be sharpened. Well, reading does just that. It's been scientifically proven that just like consistent cardio workouts improve your overall fitness, reading regularly strengthens memory function by boosting brain power. And while you might think that you pick up the most knowledge from reading non-fiction, you actually reap more health benefits from fiction. Researchers from Princeton found that fiction readers tend to score higher on measures of "theory of mind," or the ability to understand other people's feelings and thoughts. A similar study by Emory University found that being enthralled by a novel helped people put themselves in someone else's shoes. That empathy allows you to use imagination in a similar fashion to creative visualization. It's an effective way to disengage with the day-to-day stress of our lives—opening a narrative book makes for an ideal pit stop, forcing us to focus and slow down. Examining the topic for the New Yorker, social anthropologist Ceridwen Dovey wrote: "Reading has been shown to put our brains into a pleasurable trance-like state, similar to meditation, and it brings the same health benefits of deep relaxation and inner calm. Regular readers sleep better, have lower stress levels, higher self-esteem and lower rates of depression than non-readers." So open your mind, and jump into another world this month. To get you started, we've rounded up a few of our favorite new books to check out. The dystopian future that the right wing wants. A coming-of-age tale that continues for centuries. A husband is imprisoned for a crime he did not commit. A bold couple enters an infamous 10,000-mile auto race in the '50s. Embrace daily reading to boost your health and happiness. Big style in a smaller size (and smaller price tag).